Is giving to charity a moral obligation? Assuming you having the means to do so-- in other words, if you aren't in debt, are you morally obligated to give to charity? Why or why not? If so, how much are you obligated to give? One philosopher, Peter Singer, proposed a scenario where a child is drowning in a fountain, and you are passing by on the way to work in fancy clothes. He made the argument that, just as one is morally obligated to save the child despite ruining their clothes, one is obligated to give to charity despite the possible inconvenience. However, if this is true, many of us are doing something evil! I don’t feel like anyone is obligated to give to charity. I feel like you should do it because you want to do it and because it’s something that makes you feel good regardless of your financial state. I have debt and give to St Jude every time I can. It’s just something I personally love to do. So, if someone refuses to donate to charity (even if they have hypothetically millions of dollars to spare), would they be doing something wrong/evil? People offer their conclusions without any reasoning. "Yes, because I said so," is not really convincing. Why is anyone obligated to follow a moral code? Hmm, I don't quite follow what you're meaning. Ultimately, I don't think anyone is obligated to follow a moral code. By "moral obligation," I was asking whether it'd be an evil/wrong act or not if one refused to donate to charity. I consider moral obligations and legal obligations as generally separate entities. Each of us decides for our self whether to follow a moral code. How can you have a moral obligation if you don't follow a moral code? Sort of an obligation. Also at another level, you feel bad for them if a calamity has hit a place or a freak accident occurred. Could you explain what you mean by how it is "sort of" an obligation? There's a lot happening in the world - cancer, lack of education, lack of food and water, natural calamities etc. If you don't contribute to anything, nobody would say anything because nobody keeps tabs on who is contributing to what. But a small voice in your head might ask you to, especially when you are earning well at a given point in life - that's what I meant "sort of". It's almost like an obligation to your conscience even if nobody knows whether or not you are contributing. Why is it so bad for a woman to be financially interested in a man but okay for a man to be sexually interested in a woman? Is Cultural Appropriation Wrong For "Racial Right" People Too? If it was it was terraformed and colonized, and cheap and safe, would you live on Mars? Are you pro or anti refugee? Befor3 you leave your home. How long does it take you to get ready? It's not really an obligation. It heavily relies on selfless people who enjoy donating. Nobody is forcing you to donate to charity. True, it is by no means a legal obligation. My question was more so though regarding the moral aspects of it. In other words, if you have the means to give to charity, are you doing something wrong/evil by refusing to do so? A person is morally obligated to contribute to society above representing oneself and not being a burden on that society if it is within your means. That does not mean you are obligated to give to a charity. If I understand correctly, are you saying that someone needs to do something to contribute to society (apart from just existing), but they aren't required to go through charity as their means of contribution? That’s the way I see it. Yah. And. No I dont want the government determining how I should be supporting society ergo I look at wealth redistribution, compelled labor and speech with disdain. I do not think so. It can not be expected of the individual to donate to the charity especially when there are worthless charities around who do not appropriately spend their money. Instead that is the job of your government to identify and help people who are suffering around the world in accordance to universal human rights. Not so long as the government steals your money for the welfare of others I’d say if you are working and paying taxes you are free from having to give to a charity. So basically, are you saying that, since the government takes money for welfare as a means of like a forced "charity," one's moral obligation to give is fulfilled? If that's the case, what happens if someone has lots of money to spare after taxes-- are they morally required to give more to charity? Rich people pay a disproportionate amount of welfare taxes because our tax system is progressive so even rich people have an excuse not to donate unless of course they’re extremely rich and find a loophole. 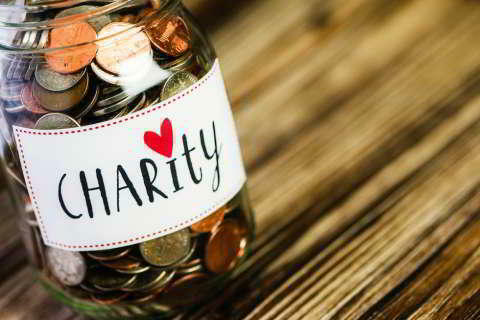 Giving to charity is always good but is it a moral requirement? Not if you’re atheist. At the end of the day, anyone with money has the right to do whatever they want with their money (sans taxpaying). And I think it’s great that everyone is capable of making their own decisions with their earnings. All that being said, I think it’s awesome when people are able to sympathize with and help those who need sympathy and help. Cliches run through my mind here, but I truly believe them- that we are all human beings worthy of respect and care. If I had th money, I’d buy stuff for people all the time and donate. Not because of morals, but because I want to. No, you do it out of the kindness of your heart. And, you do it if you can afford to. It depends. You don't have to, but its a really good idea if the person looks desperate. Like, a half conscious homeless person in a busy city, with several visible ailments... yeah. Guys on a Metro saying they've been out of a job for two weeks, but they've been turning up every day for a month... no, you don't have to. I guess it depends on how much they really need it, and what your current conditions are, like how much money you have on you, how soon you have to be somewhere, and how honest you think the plea is. This argument makes sense. I agree. No, it's a moral choice. You don't owe anyone anything, except to not actively limit their peace and freedom. Oh, so would you say it can't be a bad thing if someone refuses to donate-- it can only be a good thing if they choose to? Why I am racist to my own race and why religion should be separated from the law Low.. Low.. Low.. How low can you go. Politics Limbo.. Why I recently became pro-life! 20 Qualities of a "Real" Woman Women's Best Role: "Becoming a Housewife"
Home > Society & Politics > Is giving to charity a moral obligation?